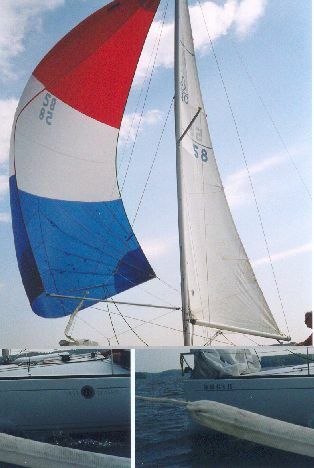 Eight F210 Owners sailed four Beneteau F210s (3 blue swing keel, 1 white fixed keel Classic) over the weekend of October 3-5, 2003 at Lake Lanier, Georgia. The weather was delightfully sunny and mild. We sailed 3 cruising courses on Saturday, totaling 22.5 miles and one course of 5 miles on Sunday. The boats averaged around 5.5 mph all day Saturday in the 10-15 mph Westerly winds. Sunday winds were light, variable and fickle. We ate like "kings" all weekend and were showered with Rendezvous goodies thanks to Club Beneteau USA, St. Barts Yachts, Inc. and West Marine. We purchased a "SUV-load" of food for the weekend and ate heartily. Including guests, 10 people enjoyed the Saturday evening dinner with Grilled Beef and Salmon steaks, baked potatoes, Cesar Salad and Key Lime Pie. We had burgers Friday evening and leftovers Sunday afternoon with Continental Breakfast and sack lunches every day. After finishing the short courses on Saturday, we rafted up in a quiet cove for lunch. Then, we sailed the long, 13-mile course. Cliff Bates received a Lewmar winch handle pocket for being the newest member to join our Rendezvous, Ken Poulsen for traveling the longest distance (from Colorado), Ron Stephenson for being the oldest skipper and Bob Truttman, for being the most abused crew! In addition we all received F210 Club Tee Shirts, Club Beneteau Pennants and sun glass holders + framed Certificates of Participation. Terry Ellis retained the Club's Perpetual Trophy. Thus, he must plan and organize next year's Rendezvous.